villa con 4 camere in affitto per le vacanze a Moraira. Controlla tutti i dettagli, le foto e le recensioni dell'immobile n° 18971. Totally all inclusive near elegant Algas restaurants and bars, walking distance to everything. Watch ships and enjoy drinks on the upstairs veranda while giant palms provide shade. A detached casita in the back garden with its own shaded sitting area outside provides a secluded accommodation perfect for grandparents or teens wishing for privacy - an area for enjoying the garden, working on the iPad, reading or relaxing with a drink, or perhaps tea or coffee in the morning. Many board games and cards, selection of books in English & German. Toaster, coffee French press, smoke detectors, first aid kit. Our friendly property manager speaks English and can be reached by telephone in case of any questions or problems that may arise. Guest book includes information on area activities and attractions with telephones and web sites with detailed "how to" information on the property. Smoking outdoors only. Bedrooms: Unit 1: 1 bedroom with 2 twin beds, 1 master bedroom with King bed and direct walk out to terrace and lower pool area. Casita: 1 bedroom with Queen bed, and a single sitting couch/bed in 2nd bedroom. All with ample storage and linens. Bathrooms: 4 bathrooms in 3 Bedroom villa Unit 1: 2 newly and completely renovated modern bathrooms each with walk-in shower. Casita: 1 newly and completely renovated modern bathroom with walk-in shower. Indoor poolside bathroom in BBQ area with inside shower and outdoor poolside hot water shower. Kitchen: Unit 1: Kitchen with appliances and cooking equipment/utensils: refrigerator/freezer, microwave, hob, dishwasher. Casita: A kettle and counter for tea and coffee service. Pool: Full kitchen with refrigerator, dishwasher, BBQ, seating for 6+ Washing machine with outside drying line First aid kit Beach umbrellas, sand drill, mats, etc. Living Rooms: Unit 1: New large flat panel high definition TV with HDMI and USB plug-ins; play your rented movies from IPad to TV. English cable channels. WiFI, CD player with iPod/USB plugs. Books, games, some toys. Casita: WiFi, kettle, cups & plates for coffee/tea service. Other: Strong WiFi signal throughout the entire property - inside, pool, both gardens. Palm trees, Yucca and fig tree all have beautiful night feature lighting. All furniture and fixtures are high quality. Back garden includes outdoor table seating 4. Cleaning/Towels/Linen Bed linen, bath, kitchen and beach towels are included. Electricity, gas, water is included. All interior areas are air conditioned. Electricity, water and central heat are not included in the long-term winter rentals . Outside Pool: Surrounded by high gardens and flowering plants, it is secluded on all sides from neighbours and is unusually private. Come dressed as you please. Pool area is designed for multi-use "living in" as though it were another large room. Outdoor "living room" on pool deck with full covered BBQ kitchen with retractable awning for additional shade. Strong WiFi internet access everywhere poolside. Pool kitchen has refrigerator/freezer for food, drinks & ice; plates, glasses, utensils in cupboards; CD player with iPod/USB plugs provides the sound. New full size dishwasher and sink at pool side makes clean-up a snap. Additional (4th) bathroom with walk in shower in BBQ kitchen and outdoor summer shower poolside both with hot water. There is a large flower-surrounded Naya seating 6 on the second level - watch ships passing by while enjoying a drink before dinner. Moroccan table for four with umbrella in front of the house overlooking the pool. Fully licensed in Spain as a registered holiday rental home - Superior class. 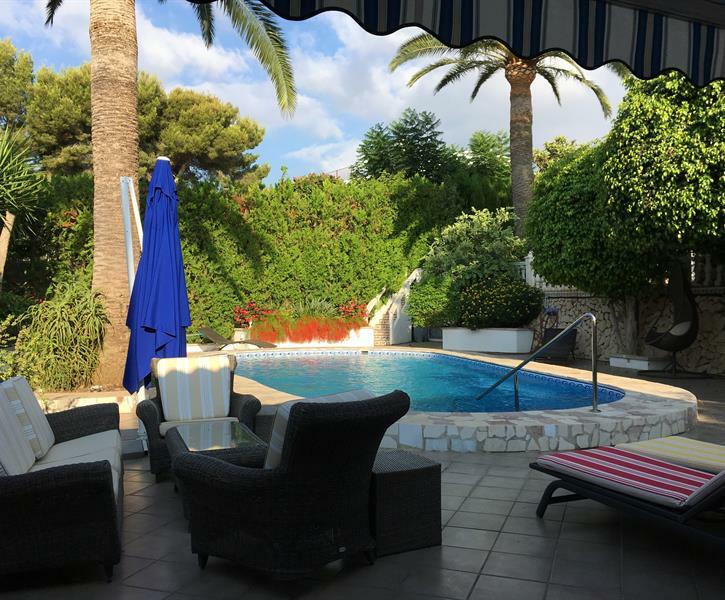 Having just come back from a three-generation family holiday at Villa Mateo, we agree with everything that’s already been said about it as a holiday home in summer, and about Moraira in general. The property was totally what we were led to expect from the website description and photos – clean, well maintained and undoubtedly the most comprehensively equipped of quite a number of villas we have rented over the years. The owners and their local management team could not have been more helpful both during the booking process and while we were there. A delightful property; certainly top of our wish-list next time we want to go anywhere in the Costa Blanca. We actually left early as it was a long Winter Rental which the owner apparently had never done before and it was quite basic for a long rental. The central heating wasn't turned on, just the hot or cold air conditioning which wasn't adequate, the bathrooms were so cold and we couldn't get our towels dry as the towel rail wasn't turned on. There was no proper oven, just a toaster, kettle and grill and the sitting area not particularly comfortable. The TV worked until we used the Wi-Fi, both couldn't be on together. The agents were very helpful and they did their best and we did get a refund for the last month. The pictures are true, this villa is fabulous especially the beautiful pool area... complete with outdoor living space/ BBQ kitchen area. The garden is really beautiful with mature trees and shrubs, the pool is great and like everything else excellently maintained. We found the owners Bill and Tania helpful and efficient right from the initial enquiry and nothing was too much trouble for them. The property was immaculately clean and equipped with everything that you could possibly need for the perfect holiday. The villa is about 20 mins walk from the main town ( which is lovely itself) the only thing I would say is that in the peak summer heat it's possibly a bit too far for younger children or elderly too walk as it's uphill on the way back. Overall we had a fabulous holiday in a fabulous villa... we will definitely be returning in the future. The villa was absolutely spotless on our arrival and even better than the ad ! We had a wonderful time in moraira and wouldn't hesitate to recommend it to anyone !